Hah, I thought I’d treat myself for finishing Nano and popped into my local charity bookshop and what do I find? 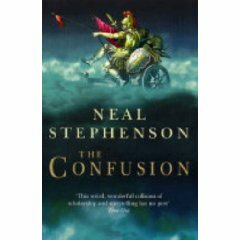 The elusive 2nd book in Neal Stephenson’s Baroque Cycle, The Confusion! You recall I almost had it in my grasp a few weeks ago when I visited the Comic and Book Exchange in Notting Hill, so this was a very pleasant surprise indeed. I screamed silently with joy. In addition to that, I also purchased Joe Abercrombie’s The Blade Itself which I had read before but wanted to give another go (this might actually be my original copy which I gave to charity, but the money goes to a worthwhile cause so mustn’t beat myself up about it. Does anyone else do this? Give away books when you run out of space and then repurchase the same books. Or am I the only saddo here?) and Gene Wolfe’s The Book of the New Sun Volume 2: Sword and Citadel (I have Volume 1 somewhere). On a bit of an SFF binge here. I’ve just finished reading the very impressive Graceling by Kristin Cashore which I will be posting about soon, and have started on The Makioka Sisters by Junichiro Tanizaki which I’m rather enjoying. « I have completed… Nano 2009!